If this was the first meeting between President Obama and Prime Minister Netanyahu, it would have been great. The President was warm and friendly. He reaffirmed the "special relationship" and "unbreakable bond" between the U.S. and Israel. 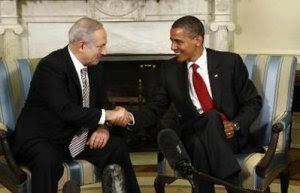 Netanyahu publicly invited Obama to come to Israel and meet there, and Obama smiled and said, "I'm ready." The problem is that this wasn't their first meeting. It was their fifth, just the first to go well. President Obama wasted the past 14 months. He has treated Netanyahu like he was the head of BP oil rather than the leader of our most faithful friend and ally in the epicenter. Thus, President Obama came into the Oval Office meeting yesterday on defense. Jewish support for him in the U.S. has plummeted over the past year as the White House and State Department have treated Israel with unprecedented hostility. Fewer than 1-in-10 Israelis believe President Obama is pro-Israel because of the administration's long string of deeply unfriendly statements and actions. The real challenge: behind the smiles of the two leaders, nothing decisive was said about how to stop Iran from getting the Bomb. And time is running out. CIA Director Leon Panetta said on June 27 that it would take Iran a year to convert the uranium they currently have to weapons grade, and another year to produce a deliverable bomb. In remarks at the Aspen Institute last week, Admiral Michael Mullen, Chairman of the Joint Chiefs of Staff, agreed with Panetta and said this was consistent with his own assessment that Iran could have the Bomb within one to three years. During his Q&A session, Admiral Mullen indicated that the U.S. believes Iran has not yet made a final decision to build nuclear weapons, while the Israelis believe Iran has made that decision. CIA Director Panetta says he believes the new round of economic sanctions imposed on Iran will cause pain, but will not force Iran to stop its development of nuclear weapons. "I would agree with that," said Mullen. This is important news that is getting overlooked by the mainstream media. So the question remains: if sanctions aren't going to stop Iran from getting the Bomb, and Iran is dangerously close to building the Bomb, what is President Obama prepared to do next? Will he take military action. I don't believe he will. Will the President support the Israelis taking military action? That remains to be seen.